The Focus Micrscope Camera allows users to display and manipulate microscope images through an iPad. 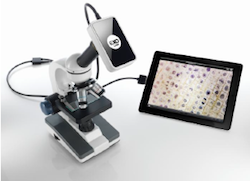 Exo Labs has launched the Focus Microscope Camera to link a classroom microscope to an iPad. Compatible with "virtually any microscope," according to a company release, once inserted into a microscope and plugged into an iPad, the Focus allows users to take pictures, annotate images, pinch to zoom, wirelessly connect to televisions or projectors, share via email, use fingertips to take measurements, and more. The Focus is available for $599. More information is available at exolabs.com.